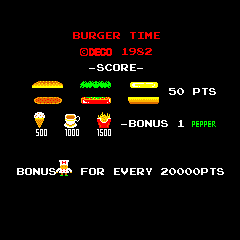 Developed and published by Data East in 1982, Burger Time is an arcade game unlike any other you’ve probably played. Combining elements of a platforming game with a puzzle game, Burger Time puts you in the chef’s hat of Peter Pepper who is tasked with putting together mattress sized burgers while avoiding enemies with iconically cute names such as Mr. Hot Dog, Mr. Pickle, and Mr. Egg. There are number of ways to avoid enemies as well as get rid of them if you need to do that. You can crush them beneath ingredients or send them falling to their demise. The possibilities are pretty endless. There is a method to the madness however because Burger Time is all about points – and lots of them. You get more points for doing certain actions over others and this causes the player to modify their play style to accommodate this. For example, it may be easier for you to crush an enemy but you will get more points for “dropping” it so you will modify your play style to allow for this. Peter Pepper can temporarily stun enemies using a shake of pepper but, aside from the above mentioned ways of dispatching with foes, is otherwise quite vulnerable. The game runs on a loop of six different stage variants that change as Peter Pepper completes each, cycling through the loop continuously with increasing difficulty as the player progresses. Like other platforming games, Peter Pepper’s playtime is based upon a lives system which can be gained and lost in the course of the game. Coming out in the same year as Zaxxon and Donkey Kong Jr., Burger Time had some tough competition when it hit the arcade scene. 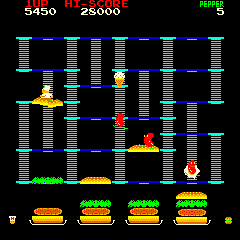 The arcades, largely driven by series that created fads that spawned endless variants on some theme, were not the easiest place for a new and novel concept like Burger Time to succeed. After all, this is the year that Super Pac Man, the third title in the series, was released and if you’re thinking it was radically different from other Pac Man games then you’d be mistaken. Variety was not the spice of life in the risky arcade business. Tried-and-true models were what many companies preferred, but Data East’s gambit proved a success and Burger Time was not only a commercial success during its time in the arcades but also the recipient of great critical acclaim as well, garnering enough attention to make it a hot property for the home console market. Today Burger Time exists as a kind of snapshot in time of what the video game industry was in the arcades. You see in Data East’s design language for the game the trend towards more heavily graphical sprites and away from the more minimalistic approaches of the past. One could easily be forgiven for mistaking this game for a Famicom game though that system still had one year until it hit the streets but the spirit is there. A common occurrence today, Burger Time’s merger of two disparate genres in such an elegant way stands the test of time and sets the game apart as a true classic of the arcades. 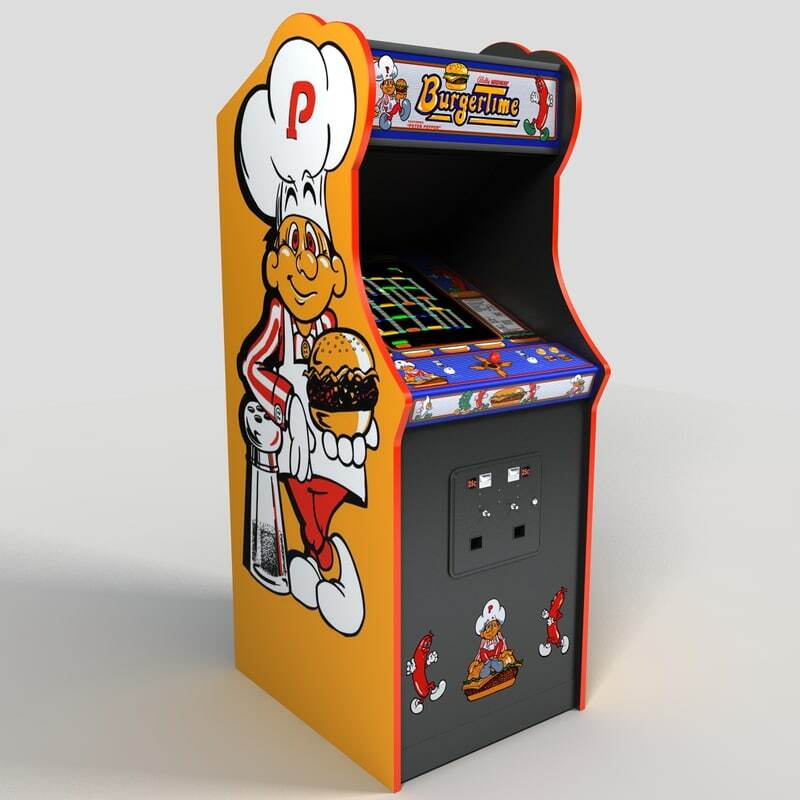 Relive the iconic Burger Time arcade game with the Burger Time Mini Arcade Machine!